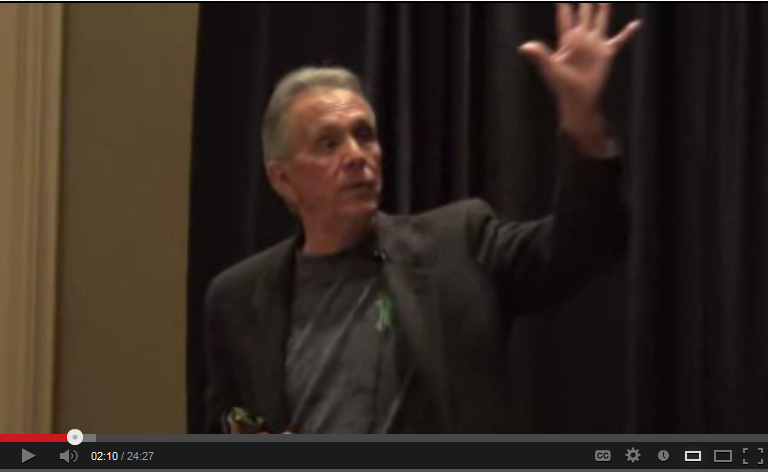 I was facing a significant emotional event, one of those moments that occurs in our journeys so as to be life-altering. In fact, it was the third one of my life, falling closely on the heels of the second one last September. That one was very hurtful and was the impetus for attending the March reunion. So off I drove to see if visiting my High Chaparral family would help reinforce in me purpose, direction and belief again in my God and fellow beings. The drive over began before dawn from the Land of Enchantment and brought with it solitude—good solitude—the kind you need when you’re contemplating important decisions, or when you’re collecting yourself in anticipation of something long-desired. The plan to attend the reunion had been formulated in January, and now the day in March was finally here. Up and down the canyons, crossing through Hatch, the green chili capital of the world, and then finally seeing Arizona’s beautiful state-flag sign of the copper star with rays of red and yellow emanating from it with the bluest of blues beneath. Upon hitting Tucson where I lived long ago for 10 years, it was obvious how the place had grown. I was home again, and it felt good. Settling in at the beautiful casino resort was flawless. What a gorgeous backdrop for what I hoped would be a joyful visit with all those who had participated in making The High Chaparral what it was, be they cast, crew or fans. Friday morning would tell me all I needed to know. I mustered the courage to abandon my post at the registration table to sneak over and say to him, “Boricua, con mucho gusto.” Henry Darrow was the reason I studied Spanish in school for seven years. Of course, after I got that out, I was tongue-tied and could hardly gaze at the man who held my hand and gave me a hug. He is so gentle, so dear. I wanted to put him in my pocket and take him home. Back to the table I went to do my duty, until Kathy pulled me over saying, “Henry, Marianne wants a picture with you.” OMG! Over I went. I posed. I beamed. Running errands inside the meeting room, I saw that Henry had joined forces with Don Collier. Between them was an empty chair and fans were popping in and out for photos with the two. Henry saw me and said, “Would you like a picture?” Really? Henry Darrow is asking me if I would like a picture between Manolito Montoya and Sam Butler? I didn’t think I could move that fast. Arms around both, the bulbs flashed. OMG. I beamed. Not too long after that, a camera crew arrived. I assumed they were local media shooting for that night’s news. Arlene, the director, came over and asked if I would do an interview with her and Harry, the production manager. Me, an interview? OMG. Absolutely! I was beaming. We shot the piece and then I asked what channel it would be airing so I could call some local friends to watch. “We’re shooting a documentary,” they said. Really? A documentary? And I just got interviewed? OMG. I beamed. Back to the table. Rudy Ramos entered. I followed him and got a hug. He’s a keeper—so quiet and sincere. Then Kent and Susan McCray came to the registration table. I asked Kent a question and he gave me a wonderful answer rich in story and fun-behind-the-scenes insight. I want to do a Vulcan mind-meld on that man. He’s brilliant and so open to sharing his knowledge. Susan is a beautiful, gracious lady with wonderful stories as well. She later shared with me how much her dad, Oscar-winning composer Harry Sukman (who also did a lot of the music on HC), loved his musical vocation so much, he practiced every moment he could. She said her children’s book, Harry’s Piano, was really about his young life. OMG. How long can endorphins last? Over the three days, I met Marc, Cameron Mitchell’s “blooded-nephew,” as Uncle Buck would say. What a delightful man who shared some fun stories of a young Uncle Cam. I met Steve, a stuntman/extra who worked on 52 episodes and who talked about how they shot some of the action scenes. I met Jan Pippins, co-author of Henry’s autobiography. Her work on the book is tremendous. Then there was Bob Shelton, owner of Old Tucson Studios, who just turned 92. We posed for a picture together and he gave me a hug and a kiss. Kiva Hoy, Bobby’s wife, was there and she shared with me wonderful insights about her husband, the chess master and avid reader. Then there was Sondra from Texas who does the Cam Mitchell Facebook page, and Rene from Tucson who actually tried out to be one of the children in the episode “Ten Little Indians,” and Ginger, our stealth photographer, and Chris from Washington who works on a guest ranch. There were the two sisters from Boston and Lorrie from Rochester and Katrin from Germany and Gemma and Christine from Great Britain, one of whom was on a water-rescue EMT team. There was MJ with the braids and a big smile. Oh, I know I’m missing so many people and I do apologize. It’s just that I didn’t realize my family was that large, that interesting and that nice. Every one of them. All of them. All of us! On to Old Tucson…The Buffalo Soldiers, and Sourdough Slim, the yodeling cowboy singer. Henry, Don and Rudy were signing everything people brought them, and trust me, there was a long line. We walked the inside and outside of the High Chaparral hacienda as it appears on our beloved show. Some even went horseback riding earlier in the day on the very soil ridden by the Cannons, Montoyas, and the Bunkhouse Boys. We saw gunfight plays put on by the Old Tucson cast. There was a Gatling gun demonstration and Native American dancers, and a trick roper who lassoed anyone who snapped his picture. Sunday morning was autographs and photos day. Prior to coming to the meeting, Penny had asked if I would compile the emails fans were sending the cast and crew from all over the world. I included a note from me to each one in the event I wasn’t able to remember everything I wanted to say. As it were, I had only managed babbling with Lauren, so I’m glad my thoughts were on paper. Penny told me I could personally deliver them to each celebrity—and today was the day! I approached Henry and presented his. Lord knows what came out of my mouth, but he was very pleased. He had signed a copy of his book, Lightning in the Bottle, for me earlier, and I moved on so others could meet with him. I heard this will be his last reunion, but he really must come again next year. Will you, Henry? Please? You really MUST! Then to Don Collier. I honestly think in his case, the name “Sam” is short for Samson. He is one huge cowboy with a heart and down-to-earth personality to match, and whose vocal cords are deep magical pipes. He could swear at me and I would still swoon. I gave him his email booklet, (he was truly thrilled), he autographed some things, and then we took a picture with me on his lap. I got a kiss, too. Wow! OMG. I was beaming. In meeting with Rudy Ramos, I must say he is so genteel and soft-spoken. Earlier in the program, he had done a first-time presentation of a project he’s developing called, Geronimo. It was incredibly well-done. Now, here I was presenting him with his emails. OMG. Again, a smile of thanks said it all. Unfortunately, Kent, Susan and Kiva had to leave early, and they were sorely missed. The morning was winding down, and with it, would come the end of our great reunion. I realized I must be part of those packing and leaving. As I stood in the ballroom entryway one last time, Henry and Lauren made their way out, too. Henry walked up to me and kissed me on the lips. Wow! OMG. I beamed. I headed for my truck and loaded up. Good bye, everyone. I drove away quietly. Sad? No, not sad. Not hurt. Not lost. Not any of those feelings that spurred me to attend. This significant emotional event showed me my roots are truly in the sands of The High Chaparral, and now I know those roots are spread literally all over the world. God opened a window to show me that there are many people of good character who do live lives of principle, loyalty, honesty, respect, justice and love just like the show’s characters who influenced me and whom I grew up to emulate. My global family members are kind, smart, fun and simply good-natured. They’re people you want to be around. We exchanged internet addresses and will stay in touch. It’s already happening. Facebook, emails, photos, snail mail. My hope is that these friendships will last the rest of my life. I continued driving toward the New Mexico border trying to wrap my mental arms around all that I had just lived through at the reunion. Then it struck me: Hey, there’s only 51 weeks until the next one. There’s so much to do to get ready. OMG. I’m beaming! *OMG: Texting abbreviation for Oh my God! How do you say thanks to friends who support you year after year? The good folks at Arbuckles' go the extra mile so our High Chaparral fans will feel special at The High Chaparral Reunion, producing a one of a kind run of High Chaparral coffee packets for our gift bags. 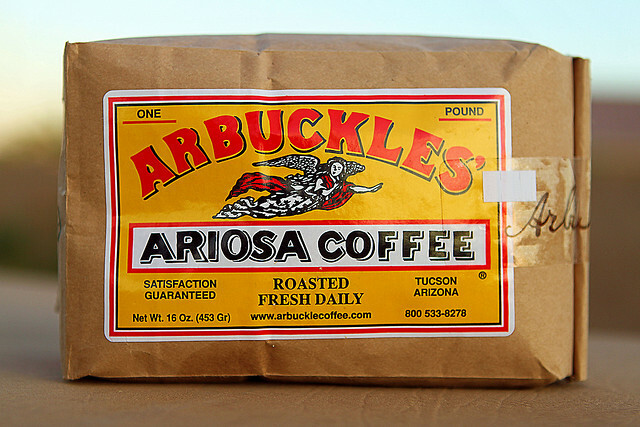 Arbuckles is the coffee that won the west....and it's also the coffee of The High Chaparral. You have to come to The High Chaparral Reunion to get the special High Chaparral coffee pack, but you can order the Don Collier special any day. Arbuckle Coffee Roasters is proud to work with Don and call him "The Arbuckle Cowboy." Visit Arbuckles' Coffee Roasters on Facebook and tell them THANKS from The High Chaparral family! See what we're talking about on Facebook? Join the party! 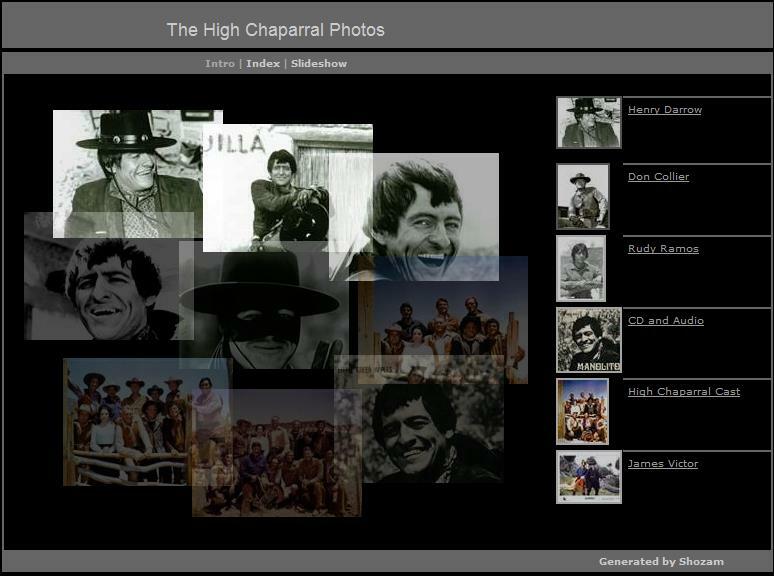 highchaparralreunion has over 1900 fans sharing photos, videos and memories. http://www.facebook.com/groups/ thehighchaparral/ has great photos, background info, witty conversation and lots of dedicated fans who remember and love the show. There are pages for Cameron Mitchell, Linda Cristal, Henry Darrow, Don Collier, Susan McCray - it's a regular ranch house. If you haven’t LIKED HC on Facebook then you're missing the conversation! 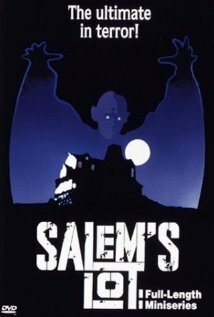 Warner Brothers announced they are planning to release Harry Sukman's originally composed and recorded music score for the 1979 motion picture “SALEM'S LOT”. Sukman is the well known Motion Picture Academy, Golden Globe and Emmy winning composer of The High Chaparral episode scores, and was nominated for an Emmy for Outstanding Achievement in Musical Composition for the episode "The Champion of the Western World" in 1968. Mr. Sukman received an Emmy Nomination for the score. Warner Brothers plans to release the album for Halloween - October 31st of 2013. 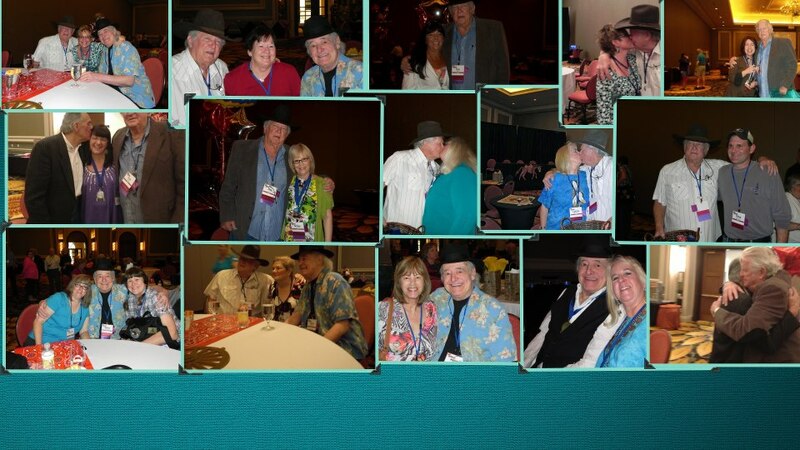 The High Chaparral Reunion keeps growing - this year was a record breaker, with almost 150 attending events. We have no idea how many were at the ranch house at Old Tucson on Saturday but it was many times that number. Without the selfless hours of volunteer support it would be impossible to pull off an event of this size. John Cannon had loyal Bunkhouse Boys, but our wonderful Bunkhouse Girls and Ranch Hands give them a run for their money! Thank you to every single person who helped out in any way. We could NEVER do it without you! Who better to tell you what The High Chaparral Reunion was like than YOU? Here are comments from fans who attended. "I KNEW, being there, that watching the show, would be different when I got home from my first Reunion. Just this morning, watching an episode, they rode across a draw, which I walked across a couple weeks ago. When I hear the music, I can remember Susan explaining how her father created, at a piano. When I see Sam/Don on the show... I remember hearing him, seeing his enthusiasm, the twinkle in his eyes. When I see Manolito, I remember sitting next to him, talking to Lauren. Every show, when I see the credits, I cheer for Kent McCray, who is a very kind man, in addition to being a master of multi-tasking. Wind/Rudy... What an amazing man of empathy, talent and chivalry. I loved watching High Chaparral before, but since the Reunion, I feel part of it. It's a place that I have been to. They are not actors on my TV, they are friends. That is just SOME of the reasons that I signed up for the 2014 Reunion as soon as or was announced. I want to be part of the magic, the camaraderie, the wonder of being in, on and a part of The High Chaparral!" "I was there. I was on cloud nine the whole time. What a wonderful feeling. There were so many surprises, wonderful entertainment, bar none accomodations, gifts, excellent food, charming hosts on your team, and the down to earth cast members who were totally gracious with their time. I am in AWE of the reunion outcome. Thanks to you and your team as this was a once in a lifetime dream come true." "Thanks for sharing this, Penny. I am also so very thankful for all that you and the other volunteers have done in helping to produce such a wonderful event. I am still processing all the positive things that I experienced this past weekend, and am so grateful to have had the privilege to meet such an astounding number of wonderful people! I plan to write more later, but words alone could not express how blessed I feel to have been able to experience the Reunion firsthand. :)"
"I'm going through withdrawals as many of us are I'm sure. ...How can we not come to future Reunions?!" 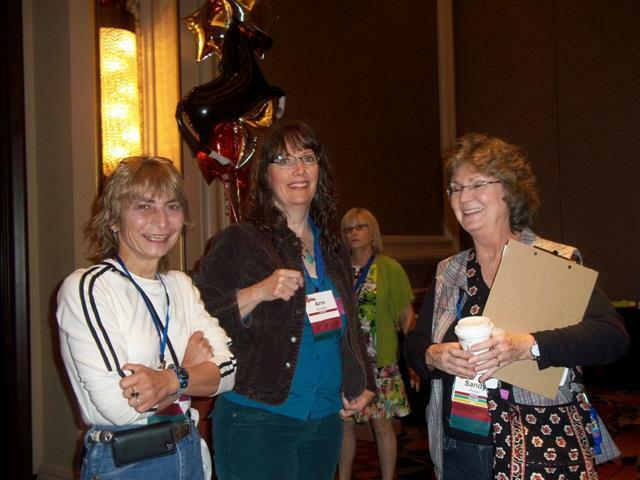 " You and your crew did a fantastic job organizing this fabulous event so that all of us had a never to forget weekend. Our HC cast are our heros too it was so evident that they do love and appreciate their fans. Thanks so much for making this a weekend I will never forget. Even my 21 year old daughter had a great time and wants to come bacK!" " As I write this I'm sipping on Mango tea and basking in the "afterglow" of another outrageously awesome reunion; mahalo nui loa (thank you very much!) for the thousands of hours you must have put in arranging everything. A great big thank you to all who helped you as well. Anticipating this reunion helped me cope with some very dark days during this past year and words fail to convey my sincere appreciation to you for making this all possible. I continue to be in awe of how friendly and warm Don, Henry & Lauren, the McCrays, Rudy, the De Waays and all the HC family are; I feel truly blessed to have been around such fine people. Reconnecting with Nieves, Michelle, and others was also amazing - definitely icing on the cake!" . 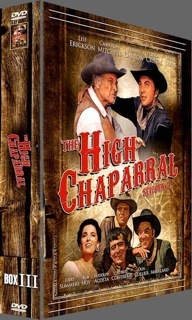 "I don't think I've ever seen a cast as loyal to their fans as the High Chaparral cast. It's a joy to watch them interact with fans from all over the globe. There is a bond between them that will never be broken." "To all-who produced-assembled-arranged-attended and enjoyed-the Reunion-thank you! Speaking for myself-I haven't come down to earth yet-but am expecting to land any day now. I've been so wrapped up with unpacking, returning to work, finding little goodies I got that I look at or play daily. Please attend the next Reunion folks-if the High Chaparral meant anything to you-you will be so pleased that you did. :)"
"We had so much fun at the reunion. We were a bit star struck at first but it has been a dream come true for us to come and meet some stars of the high chaparral....The trip to old tucson was the high light for me. The trail ride on chaparral land was amazing - riding where the show was made. Meeting Don, Rudy and Henry was great fun. Don is such a smoothie and so much fun. Rudy is such a gentleman and his reading on geromino was full of compassion and heart felt. Henry was sweet and a glint of manolito charm shone through in his eyes and smile. Kent McCray was an adorable man but it was a pleasure to meet them all. I also had the privilege of speaking with Kiva Hoy and we shared some private memories speaking about our late husbands and my son. She was a genuine caring lady, full if compassion and so beautiful. Meeting the lovely fans and feeling part of a very special group made the reunion. I will definately try to be there next year as I felt so at home and at ease with everyone. Thank you once again for arranging the reunion and for bringing the stars and fans together. Gemma and I have always thought we were alone in how we felt about the high chaparral but now we know we are not the only ones. " "I'm so glad that they felt the love and appreciation that we felt for them! Even though we went from sunup to sundown and I lost a lot of sleep due to traveling, I came away from the reunion feeling so fulfilled, refreshed and happy! This was due in part to the wonderful camaraderie I felt among all the fans and the fellowship and new friends I made! I actually felt like I made new friends not only with the fans but with the Stars!" "Thank you for all you do for people you don't know but care so much about. From around the world, we will never be able to thank you enough." ART-S Media plans to release Seasosn 3 of The High Chaparral on DVD in September. Each DVD set is $65.00 plus shipping, this is approximately what you would pay ordering from the Netherlands with foreign conversion/shipping. The DVDs are in English, region-free/PAL format. The majority of US players accept these with no problem. 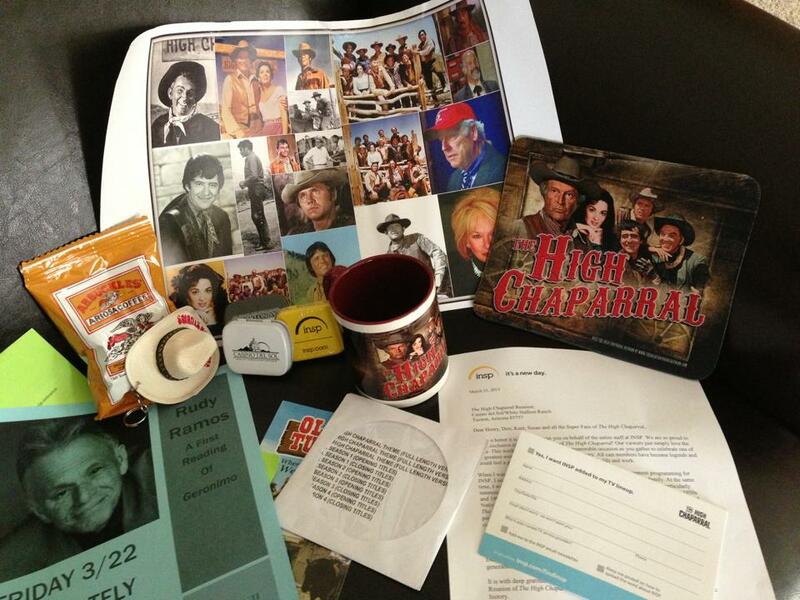 Fans and celebrities demanded and we listened - there WILL be another High Chaparral Reunion in 2014! Although exact dates aren't set, we know it'll be sometime in March or April 2014 in Tucson. And believe it or now, we already have TWENTY-THREE fans registered to attend! Don Collier, Rudy Ramos, Kent McCray and Susan McCray are committed to attend. They're all working on something special for fans. 2014 will honestly be better than ever with our stars planning a year ahead how they're going to surprise you. If you know you're going to The High Chaparral in 2014 no matter what then sign up now. It's a smart move because the rate is $255 for Thursday thru Sunday. The price will go up when we announce exact dates so register now and save. Big John will be proud of you. A sincere and heartfelt thank you to INSP, Arbuckles' Coffee, Old Tucson, Casino del Sol, Penny McQueen, and The High Chaparral Reunion for providing items for our gift bags. You made it like Christmas on The High Chaparral for everyone who attended. Thank you for making our Reunion special and memorable. Do you have a picture of Manolito Montoya, Sam Butler and Wind, personally signed to you? How about a CD from Henry Darrow, Don Collier or Rudy Ramos?